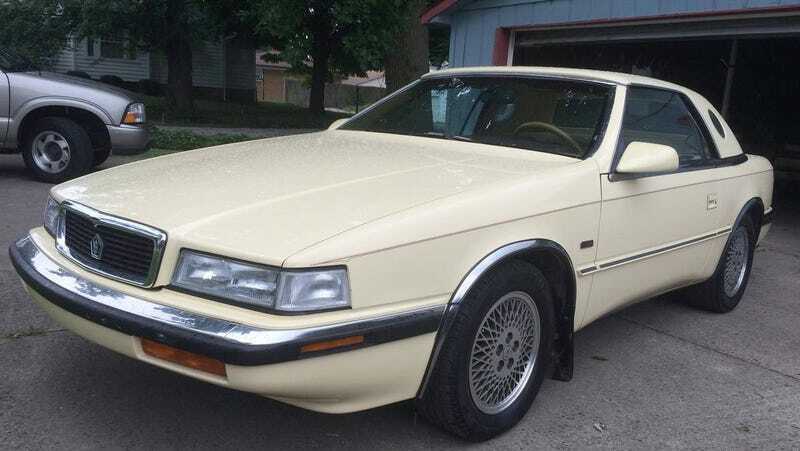 At $10,000, Could This Rare 1989 Chrysler TC by Maserati Find Its Niche? There are so many names dropped by today’s Nice Price or Crack Pipe TC—Iacocca, De Tomaso, Maserati and Cosworth—that you might need a Rolodex just to keep track. Let’s see if this rare DOHC edition is worth adding your name to that list. Think for a minute about the movies’ most hair raising tropes—brain-chomping zombies, parasitic aliens, or perhaps a clown that has set up shop in a storm drain. All pretty terrifying, right? Now think about yesterday’s 2008 BMW 135i. Like noises from the basement or a toy boat making its escape down a rain-flooded gutter, that car’s rare manual transmission proved an almost inexorable attraction. The rest of the car looked equally inviting, but a declaration of recent and major work having been done did not bode well for avoiding future horrors in the form of service department bills and towing charges. At a $15,950 asking, fully 64 percent of you felt it too big a risk and voted the car down in a Crack Pipe loss. Thanks to you this one potential horror story we all might avoid. You know, when looking at Chrysler’s present relationship with Fiat, it’s with wistful pleasure that we recount the company’s previous dalliances with Italy’s auto industry. The earliest of those took place in the late 1940s when Chrysler took Fiat up on an invitation to come to Italy to train the Italians in the latest production efficiencies post-war America had concocted. Not long after that, Chrysler returned to the Boot-shaped nation to engage Carrozzeria Ghia to build six Virgil Exner-designed coupes. Roll forward a couple of decades and you’ll find another Italian connection with the company when Lee Iacocca took up the reins, leading the company out of the Seventies and near financial ruin. Iacocca’s big win for the company was in securing federal loans to keep Chrysler afloat until they could get some fresh and innovative models up and running. Those models were the K-cars and whatever your personal opinion of the eventually ubiquitous platform, there’s no argument that it kept the company going throughout the Eighties and well into the Nineties. Iacocca’s Italian heritage and long-standing friendship with Italian boutique car baron Alejandro De Tomaso led to what is probably the ultimate expression of the K-car platform, and a car that represents one of the weirdest family trees in all of autodom. This 1989 Chrysler TC by Maserati doesn’t just have a cue-card demanding name, it really is the amalgamation of multiple brands all of which seem, on paper, incongruous. The De Tomaso connection is by way of his relationship with Iacocca. They had bonded in the Sixties when De Tomaso came to Ford first for engines for his Vallelunga and Mangusta sports cars and then for a distribution deal for the later Pantera. De Tomaso at the time owned Maserati, and as that nameplate held value the two men signed a letter of intent for Maserati to build a special luxury coupe on a new K-car derivation, the Q platform. The resulting car would be FWD, but would otherwise feature the ultimate in luxury accoutrements and fine Italian craftsmanship. The name, Chrysler TC by Maserati is a mouthful, but is ultimately an accurate description of the car. Most of the 7,300 TCs were built with either a 2.2-litre Turbo II four cylinder and automatic, or later, a Mitsubishi-sourced 3-litre V6. This beige on butternut car is one of only about 500 to be imbued with a DOHC version of the 2.2 backed up by a Getrag five-speed manual. That 200 horsepower four has lovely cast alloy cam covers with the Maserati script above its crinkle finish, but the head was actually manufactured by Cosworth in England. That adds yet another venerated name to our car’s litany of proud parents. The cars themselves were built at Innocenti, which was yet another of De Tomaso’s holdings at the time. The bodywork on this TC looks to be in exceptional condition. Both tops are intact and offer the choice of open air motoring or a hernia operation should you try and lift the hardtop in place by yourself. The interior pulls together an odd amalgamation of K-car and Maserati Biturbo styling and parts, but it’s undeniably luxurious looking and offers womb-like leather seats and lovely wood. Other plusses here are a modest 36K on the clock and a title that is clear. The seller doesn’t give any sort of detail as to the mechanicals, and honestly I’d want to at least know when the timing belt was last done. These are non-interference engines, but it’s still not something you’d want to have to do without planning. The asking price is a nice round $10,000 and it’s now time for you to decide if that’s a fair price for this multi-parent K-car offspring. What do you think, could this TC command that much cash? Or, for that much do you need fewer names and more history? 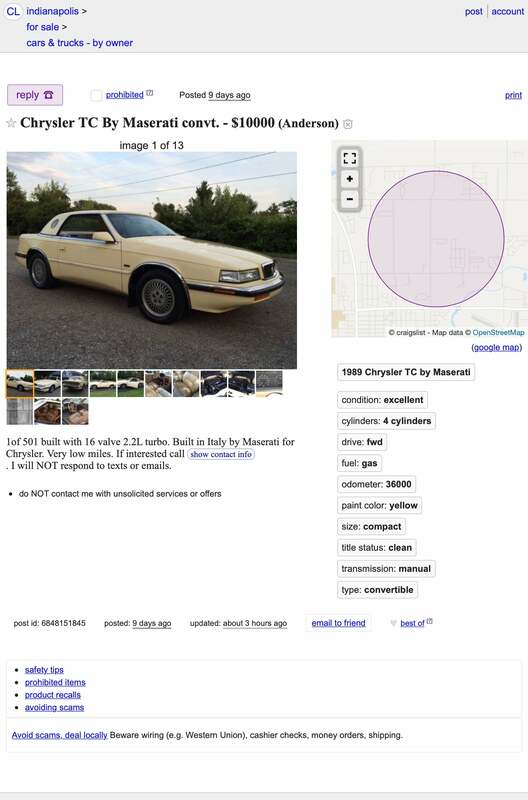 Indianapolis, IN Craigslist, or go here if the ad disappears. At $15,950, Could This Rare 2008 BMW 135i 6-Speed be a Manual Labor of Love? For $2,500, Would You Fly With This 1989 Eagle Premier ES? At $8,495, Would This Armored 1990 Jeep Wagoneer Limited Prove a Safe Bet?